I have yet to comment on the whole thing-a-ma-jig that went down on Capital Hill last week with the congressmen and the baseball players and the trainer because they all made such fools of themselves for what amounted to no reason and it is equally pointless for me to pile on to their superfluous misfortune. 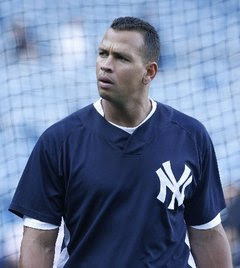 But if I was a baseball player I would have to say something and Alex Rodriguez, the most prominent name in baseball to so far escape serious performance enhancing innuendo, was forced to field questions about steroid use in baseball as he arrived in Florida for spring training. A-Rod complemented the league's more recent policies, and then made the claim that he had been tested "nine to ten" times last season. It turns out the only way he would have been tested that much is if he had a previous positive result -- which Rodriguez does not. When he learned of the discrepancy, A-Rod countered that he wasn't being "literal." Fair enough, as hyperbole might be the best response to this whole charade. But when he was done clearing that up, Rodriguez dropped some verbal excess concerning embattled teammate Andy Pettitte that goes far beyond common rhetorical techniques such as "figurative speech" and "hyperbole" and ventures straight into "batshit insane." Andy is one of the greatest human beings I've ever met," Rodriguez said. "I have two daughters -- well, I have one and one on the way. If I had a daughter, I would want 'em to marry Andy Pettitte. The age difference might be a little awkward, but in today's day and age anything is possible. You probably need to read the quote more than once to get its full effect.